Learning Italian vocabulary is really important, not only for improving your Italian level, but also for expressing your ideas in a clear and concise manner. Today we present the body parts in Italian singular and plural. Bear in mind that these words sometimes have different genders (masculine or feminine) depending whether they are singular or plural. For example: the arm – il braccio (masculine); the arms – le braccia (feminine). 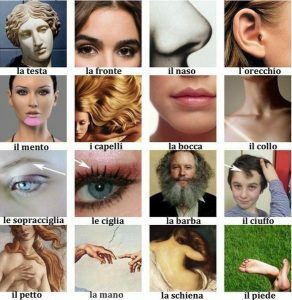 Let’s see what the main human body parts in Italian are, and remember that if you want to discover more about the Italian language we offer Italian lessons with native and qualified tutors. Learning the body parts in Italian in singular and plural is very useful. Should you want to study a more detailed in-depth list, click here. Also, if you would like to learn how to further describe yourself or another person in Italian language, along with fun, practical uses of vocabulary, grammar and phrases, please don’t hesitate to contact us. We are eager to help you learn Italian in the most enjoyable way you have ever imagined.